"All of Noel Coward's plays feature characters in—or out of—love." observes Derek Bertelsen, director of Pride Films and Plays production of Design For Living. While no one would ever mistake Coward's flagrantly unconventional lovers for your standard-issue Jack-and-Jill sweethearts, the cheerful amorality reflected in the English author's comedies appears to be responsible for Chicago's fall season boasting a thoroughly-unplanned festival of not one, but three, Coward comedies—the aforementioned Design For Living, ShawChicago's Private Lives and Remy Bumppo's Fallen Angels—running concurrently through the late fall season. The premises are as varied as their solutions are unorthodox: In Design For Living, two men and a woman prove more faithful to one another than to their legally-wedded spouses, Private Lives proposes a couple whose compatibility is based in their mutual animosity, and the neglected housewives of Fallen Angels fear the temptation presented by a reunion with the object of their premarital flings. Far from concluding in remorse and regrets, however, Cupid's path unanimously ends with its wayward pilgrims vowing to enjoy their happiness where and as they find it. What accounts for the sudden attraction in 2015 for the giddy license of the 1930s? 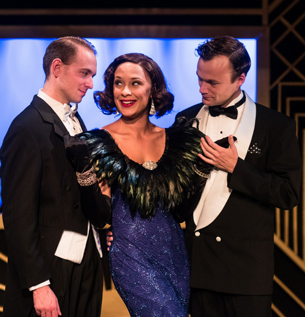 "Today's audiences are as tickled by Coward's dry and forthright wit as they ever were," insists Private Lives' director Barbara Zahora. Shannon Cochran, director of Fallen Angels, concurs, "The sparkling rhythms of the language have a timeless sophistication." Don't discount the "Downton Abbey" factor, either, Bertelsen reminds us, describing the lure of age where life—for the privileged, anyway—was simple. Escapism is only part of the seduction, though. The directors are unanimous in their assertion that the problems faced by Coward's irreverent socialites continue to be relevant to our society today. We may pay lip service to, say, the right of proper matrons to have fooled around before marrying—but why has it taken so long for Fallen Angels to be revived? Why are playgoers still uneasy at Design For Living's flouting of the Platonic ideal of a single predestined mate? "In every one of Coward's plays, we're looking at people and their issues through a different lens today than the original audiences did." says Zahora, while Bertelsen agrees, "Times have changed but complicated relationships haven't." Nowhere is the evolution of audience sensitivity more pronounced than in the physical violence required of Private Lives' Amanda and Elyot, whose squabbles escalate from shoves, to punches, to full-out furniture-throwing mayhem. Modern productions usually try to soften any potential ugliness by keeping the bodily aggression in the range of tournament-sport wrestling, but Zahora maintains that ShawChicago's chamber-reading format doesn't alter the dynamic a bit. "I think it's extremely important to note that Amanda and Elyot are evenly matched, and that neither has ever been critically injured by their rough-housing." Bertelsen also maintains that the gay undercurrent in Design For Living has been too long ignored. While dramatic confessions (as in the film version of Cabaret) would clash with the play's comedic tone, his interpretation of the male-to-male side of the triangular bond shared by the trio of artists strives to justify the spiritual and sexual attraction "that Coward made as scandalous as he could, for the time when he was writing it." "Love is Love.That's the lesson of any Coward play."